Last year’s lineup for the Macbook Pro line might be a bit disappointing to some as there’s not a lot to differentiate then with their Macbook Air counter parts. 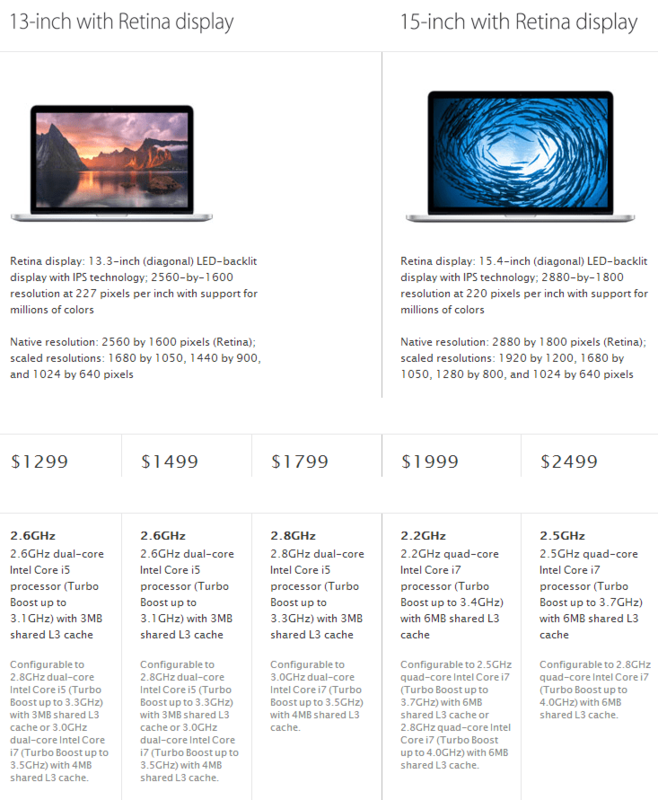 Apple’s recent spec update to it’s current Macbook Pro line ups the ante a bit more with three new 13-inch models along side two 15-inch ones. The lowest end of the 13″ MBPR line now comes with 2.6 Intel Core i5 chip and 8GB of memory from the original 2.4GHz Core i5 processor, and 4GB of memory while it’s siblings sport a larger SSD (with the top end unit shipping with a slightly faster processor). The 15″ MBPR line now comes with the latest i5 and i7 processors from Intel along side a generous offering of 16GB of RAM. No change on the GPU front however.